University Of Iowa Press, 9781609386290, 160pp. 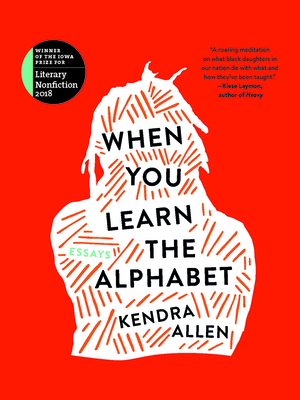 Kendra Allen’s first collection of essays—at its core—is a bunch of mad stories about things she never learned to let go of. Unifying personal narrative and cultural commentary, this collection grapples with the lessons that have been stored between parent and daughter. These parental relationships expose the conditioning that subconsciously informed her ideas on social issues such as colorism, feminism, war-induced PTSD, homophobia, marriage, and “the n-word,” among other things. These dynamics strive for some semblance of accountability, and the essays within this collection are used as displays of deep unlearning and restoring—balancing trauma and humor, poetics and reality, forgiveness and resentment. When You Learn the Alphabet allots space for large moments of tenderness and empathy for all black bodies—but especially all black woman bodies—space for the underrepresented humanity and uncared for pain of black girls, and space to have the opportunity to be listened to in order to evolve past it. Kendra Allen was born and raised in Dallas, Texas, and is currently an MFA candidate at the University of Alabama. Her work has been published in Brevity, December Magazine, and the Rumpus.